William Merritt Chase (1849–1916), In the Studio (c 1892), oil on canvas, 73.7 x 58.4 cm, Private collection. The Athenaeum. The studio is personal to the artist. Freed from the earlier need for a full supporting workshop with craftspeople, canvas manufacture, and paint preparation, from the eighteenth century the studio often became an intimate extension of the artist’s persona. 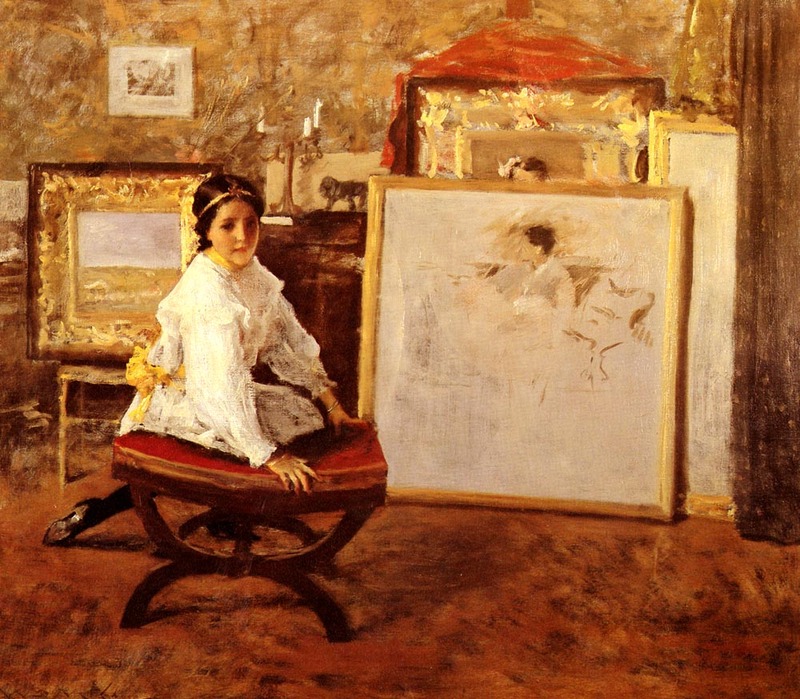 For William Merritt Chase (1849–1916), it was also one of his most frequent motifs. His first proper studio was probably that shared with James W Pattison in St. Louis, from 1870. When he went to Europe in 1872, he seems to have established a studio in Munich by 1876, and started collecting furniture and curios with which to fill it. When Chase and his friend Frank Duveneck made their Turkish Page paintings in 1876, they did so in Chase’s studio. Chase even recorded the event in his Duveneck Painting the Turkish Page (1876), which ensured that he had not only painted his own version of this motif, but had also painted Duveneck’s. Soon after his return to New York, he rented the main gallery in the Tenth Street Studio Building, at 51 West Tenth Street, Greenwich Village, New York City. For the next seventeen years (1878-1895) this was to be his place of work, public image, extended persona, private stage, personal gallery, and the motif for at least a dozen of his paintings. The building, designed by Richard Morris Hunt, had been completed in 1857, was demolished in 1956, and was one of the first in America to be designed specifically for visual artists. Notable previous occupants include Winslow Homer, Frederic Church, and Albert Bierstadt. When Chase moved in, the building was owned by John Taylor Johnston, later the first president of the Metropolitan Museum of Art. Noel Rowe (?, dates not known), William Merritt Chase in his studio on Tenth Street, New York (c 1895), albumen print, 11.4 x 19.4 cm, William Merrit Chase Archives, Parrish Art Museum, Southampton, NY. Wikimedia Commons. This photograph, taken in 1895, the year that it closed, shows Chase in his Tenth Street Studio. On its walls hang his copies of Old Masters, as well as his own original paintings. At the left, the large landscape painting on display is one of his Shinnecock works. 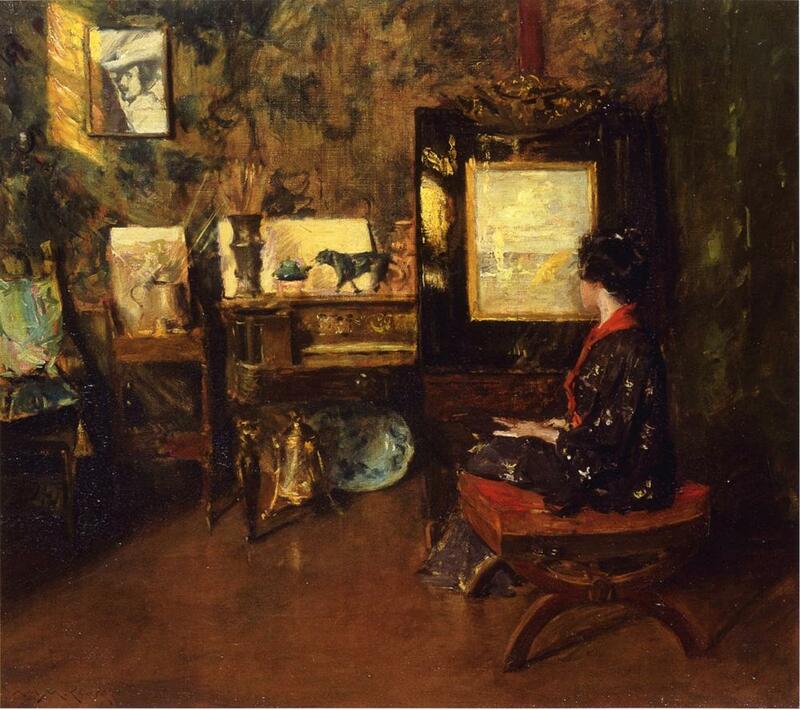 William Merritt Chase (1849–1916), Studio Interior (c 1879), oil on canvas, 55.9 x 35.6 cm, Private collection. The Athenaeum. 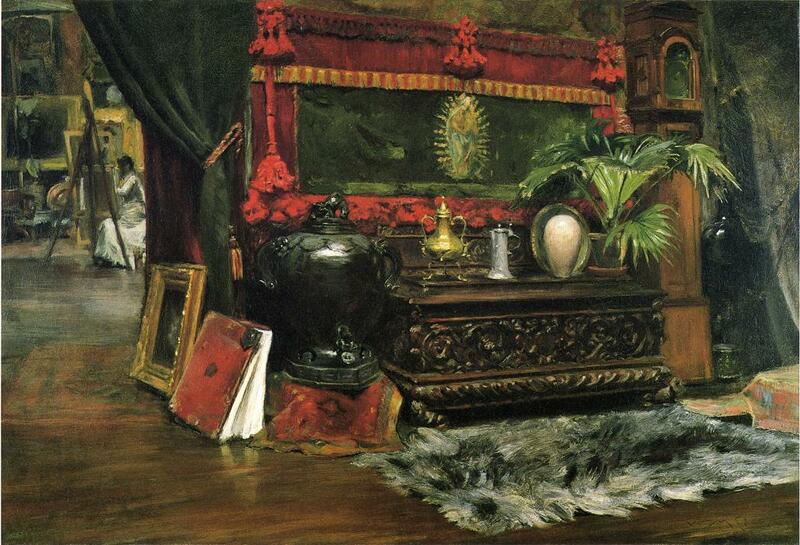 Painted just the year after he moved in, his Studio Interior (c 1879) is one of his few paintings of his studios which does not include a figure, but shows off his ornately carved wooden chest, a copy of an Old Master, and some of his more exotic props. Chase was quick to recognise the promotional value of his studio: as it grew steadily more exotic, and more populated with his own work, he encouraged the press to write about it, to promote his image as a successful artist. William Merritt Chase (1849–1916), The Tenth Street Studio (1880), oil on canvas, 92.1 x 122.6 cm, Saint Louis Art Museum, Saint Louis, MO. Wikimedia Commons. By the following year, his The Tenth Street Studio (1880) shows one of his portraiture clients, engaged in discussion with a painter who could be Chase, but recedes into the shadows. At the woman’s feet is an elegant dog, and she is surrounded by intriguing and tasteful objects. William Merritt Chase (1849–1916), Tenth Street Studio (c 1880-81 and c 1910), oil on canvas, 119.1 x 167.6 cm, The Carnegie Museum of Art, Pittsburgh, PA. The Athenaeum. Tenth Street Studio (c 1880-81 and c 1910) appears to be another promotional oil sketch aimed to bring in commissions, as a couple examine works for sale, and an assistant sits working at a table on the left. 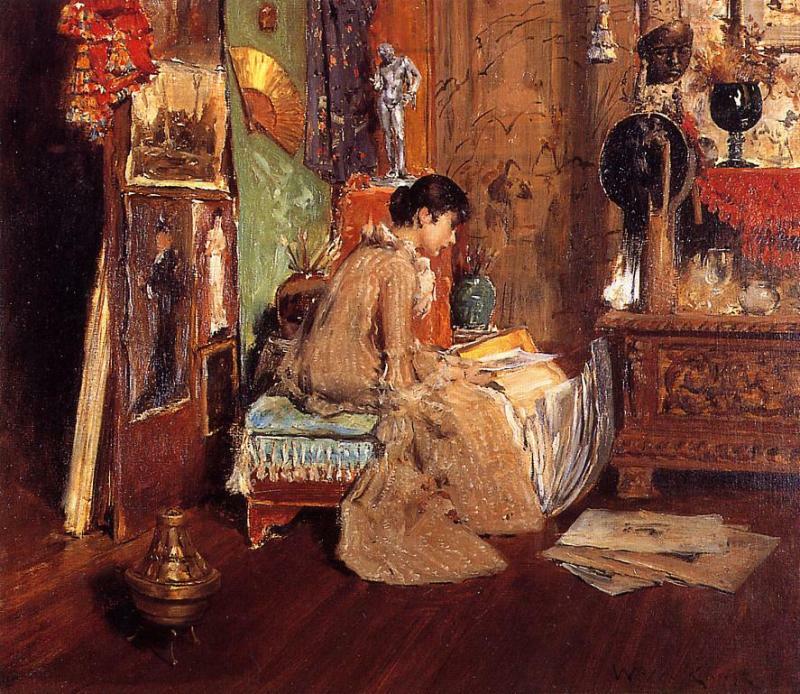 In his Studio Interior (c 1882), another fashionably dressed young woman is glancing through a huge bound collation of Chase’s work, sat by an even grander carved wooden sideboard, decorated with almost outlandish objects including a model ship, a lute, and sundry objets d’art. 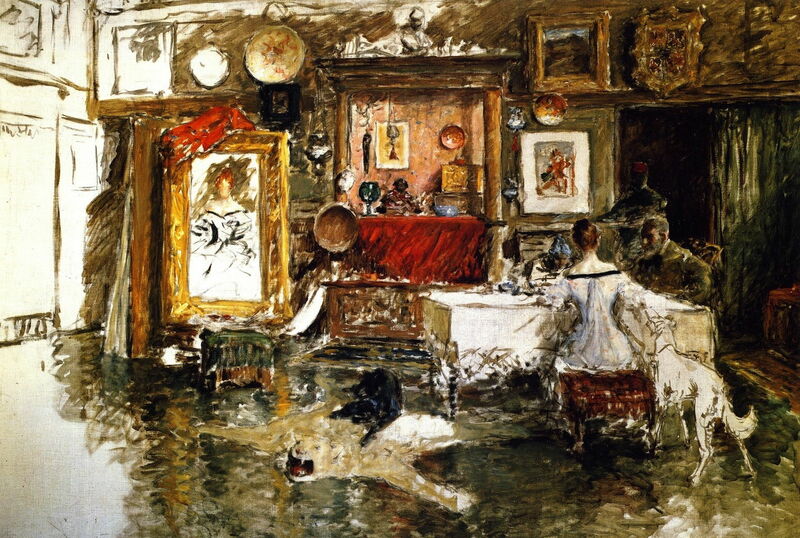 William Merritt Chase (1849–1916), The Inner Studio, Tenth Street (1882), oil on canvas, 82.2 x 112.4 cm, The Huntington Library, San Marino, CA. The Athenaeum. 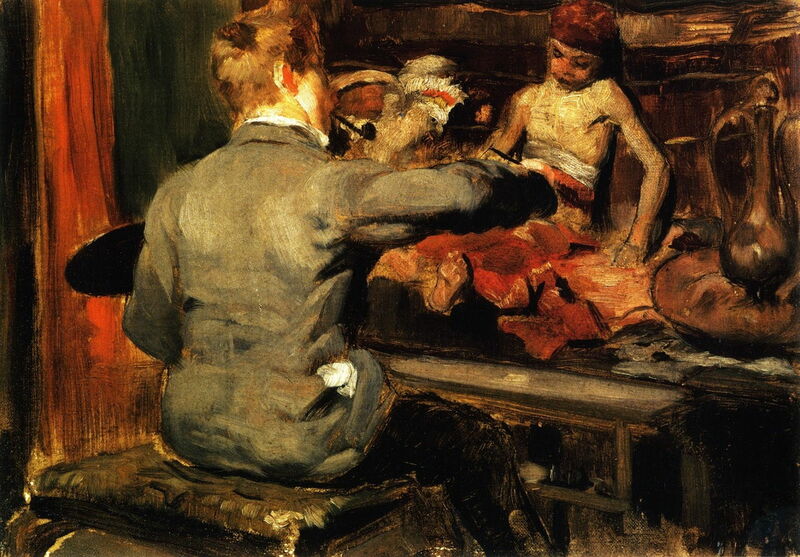 His The Inner Studio, Tenth Street (1882) takes us deeper into his artistic persona, where one of his students is hard at work. 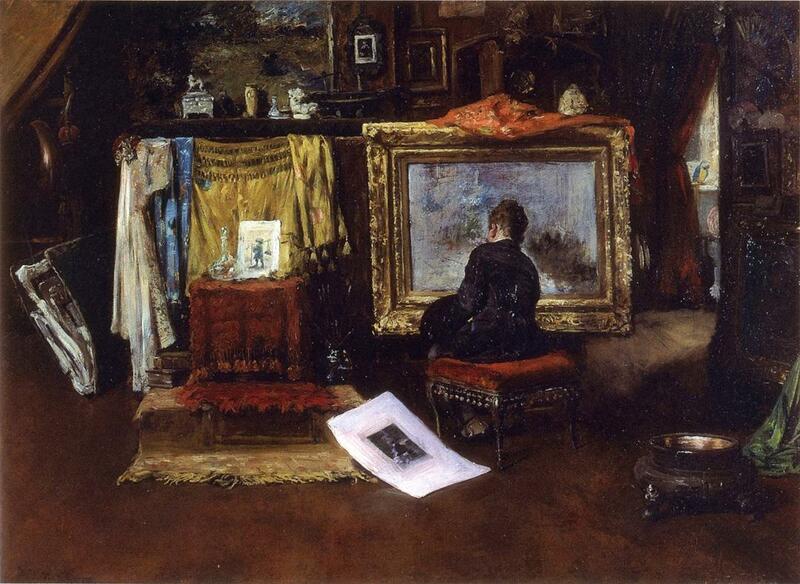 William Merritt Chase (1849–1916), Connoisseur – The Studio Corner (c 1883), oil on canvas, 50.8 x 55.9 cm, Canajoharie Library and Art Gallery, Canajoharie, NY. The Athenaeum. 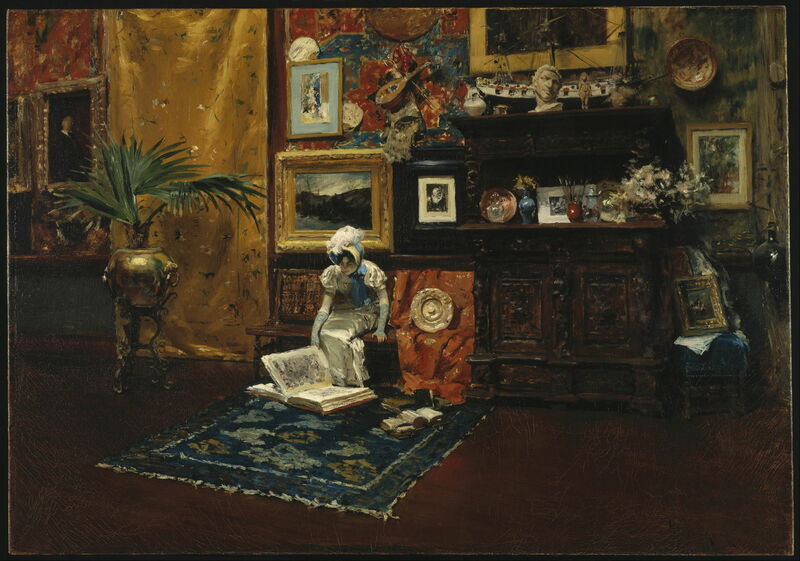 Connoisseur – The Studio Corner (c 1883) marks an interesting change in these works. The figures now start to become a larger and more prominent part of the painting, as if these are now made as part of his preparations for the coming portrait. The walls are also more decorated with evidence of his fashionable Japonisme: a glistening fan, and printed silk. 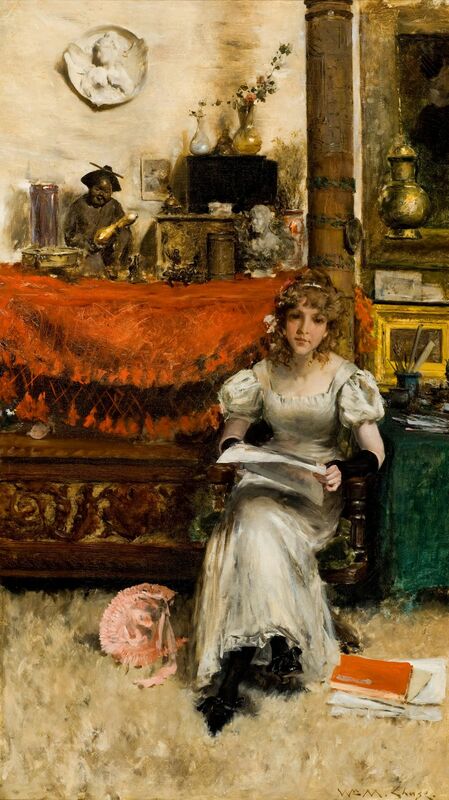 William Merritt Chase (1849–1916), In The Studio (Virginia Gerson) (c 1884), pastel on paper laid down on linen, 99.1 x 57.1 cm, Private collection. Wikimedia Commons. 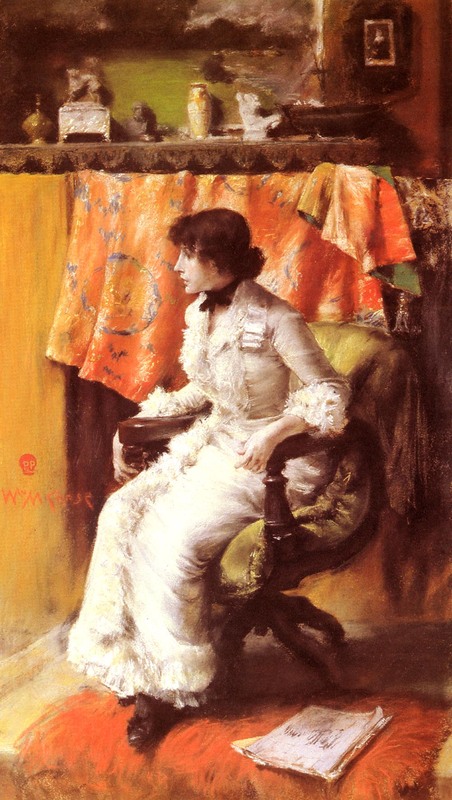 Chase sketched some of these in pastels, such as In The Studio (Virginia Gerson) (c 1884), suggesting that this informal portrait was intended for his own reference. Chase appears to have painted at least two portraits of Virginia Gerson, who became his sister-in-law when he married in 1887. These were in 1880 and 1895, when she was approximately 16 and 31 years old, I believe, but if this painting is correctly dated, it was made when she was twenty. 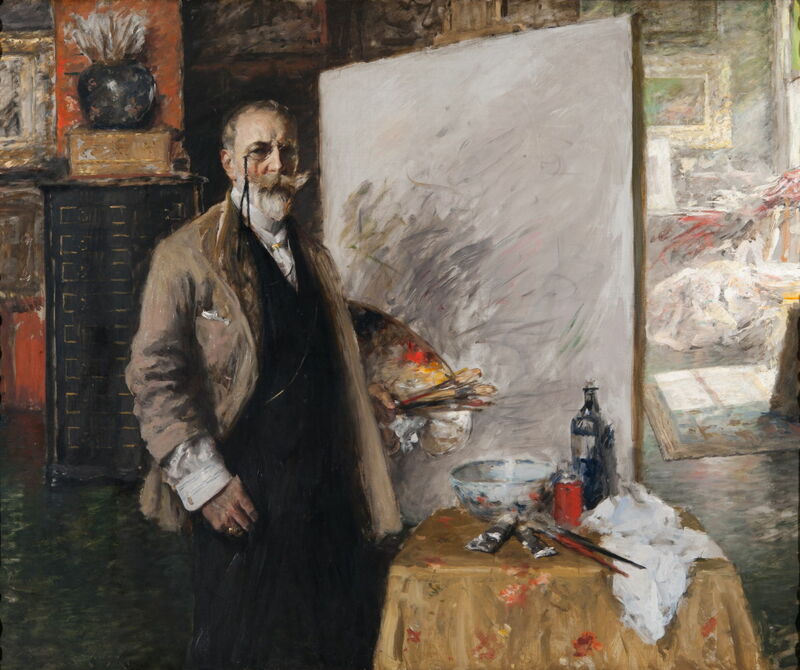 William Merritt Chase (1849–1916), In the Studio (c 1884), oil on canvas, 99.7 x 57.8 cm, Reynolda House Museum of American Art, Winston-Salem, NC. Wikimedia Commons. In the Studio (c 1884) is less of a quick impromptu study, more detailed and finished, the model now looking directly at the painter and viewer. It still retains its informality, though, with papers and a pink hat discarded on the lush carpet. Behind the subject is another of Chase’s carved wooden chests, on top of which is an East Asian figure. William Merritt Chase (1849–1916), The Tenth Street Studio (unfinished) (c 1884-1915), oil on canvas, 135.9 x 198.1 cm, Private collection. The Athenaeum. His unfinished sketch of The Tenth Street Studio (c 1884-1915) has Chase sat at a table, perhaps with his wife, and a large dog. In 1890, the Tenth Street Studio hosted La Carmencita, a popular Spanish dancer then touring in New York, who performed there on the evening of 1 April, in front of John Singer Sargent and Chase while they sketched her for later portraits, as detailed here. With the artists was Sargent’s patron, Isabella Stewart Gardner (1840-1924), a leading patron, collector, and philanthropist. 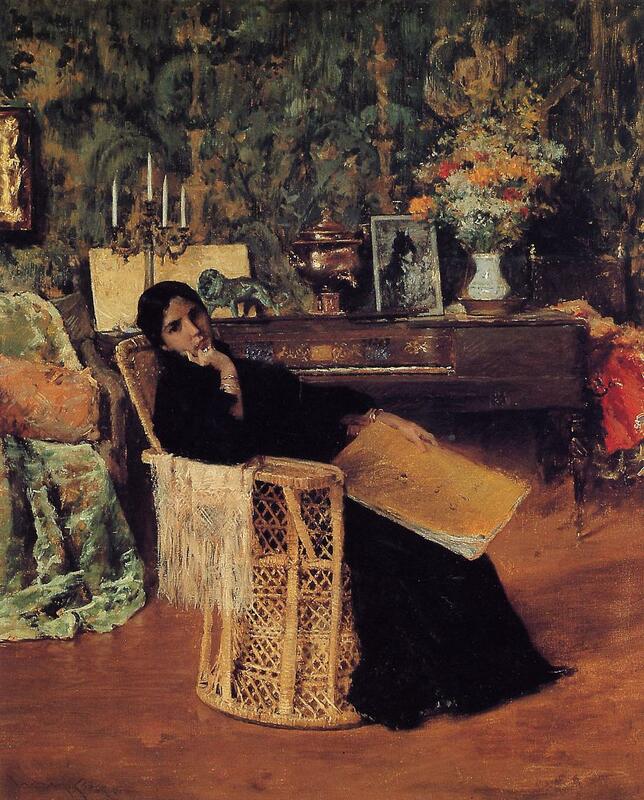 By the time that he painted In the Studio (c 1892), he seems to have had a harpsichord (or similar) installed, and the walls papered. But they form a backdrop for what is foremost a wonderfully loose and informal portrait. 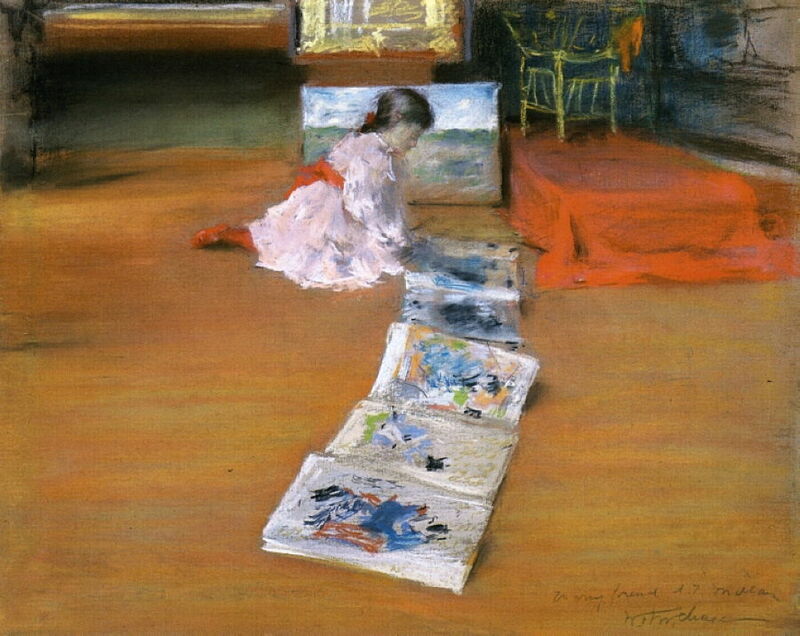 William Merritt Chase (1849–1916), In the Studio (c 1892-3), pastel on paperboard, 55.9 x 71.1 cm, Hirshhorn Museum, Smithsonian Institution, Washington, DC. Wikimedia Commons. In the Studio (c 1892-3) is another superb pastel study showing a corner of the Tenth Street Studio, as an informal portrait. 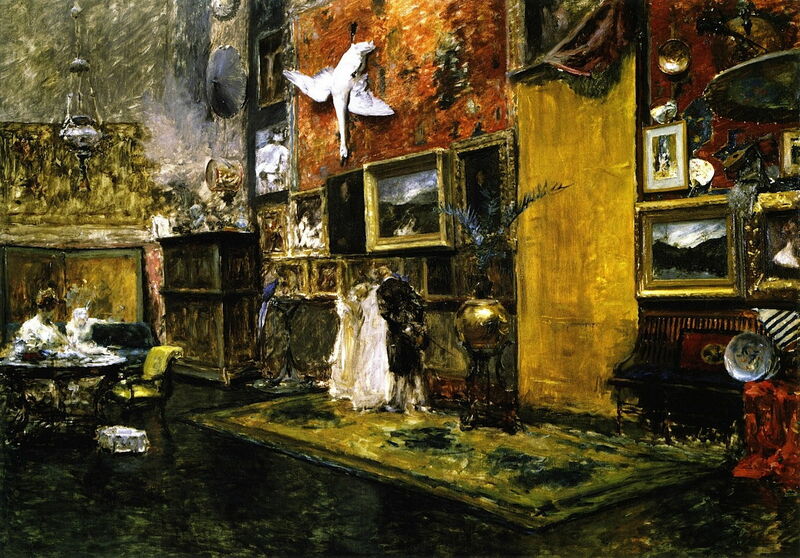 William Merritt Chase (1849–1916), A Corner of My Studio (c 1895), oil on canvas, 61.3 x 91.4 cm, Fine Arts Museums of San Francisco – de Young, San Francisco, CA. The Athenaeum. A Corner of My Studio (c 1895) is a more formal and finished record of Chase’s studio in its final year. 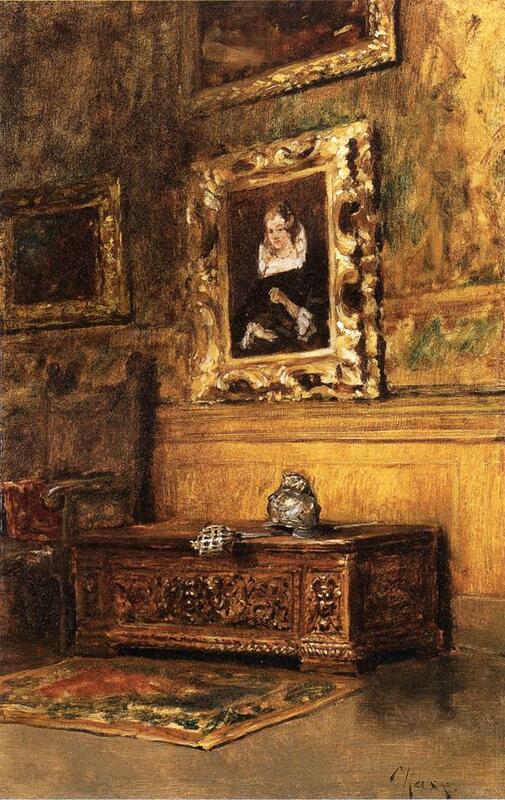 Although it seems familiar, I think this is the first painting in which this particular carved chest has appeared, and it matches that shown in the photograph above. Through the curtained doorway, we see in the distance one of Chase’s students painting diligently. This is not a portrait of a person, but of the studio once again. In 1892, Chase moved into the family’s new home in Shinnecock, Long Island, with its own studio, which he used during the summers when he was living and teaching there at the plein air painting school. 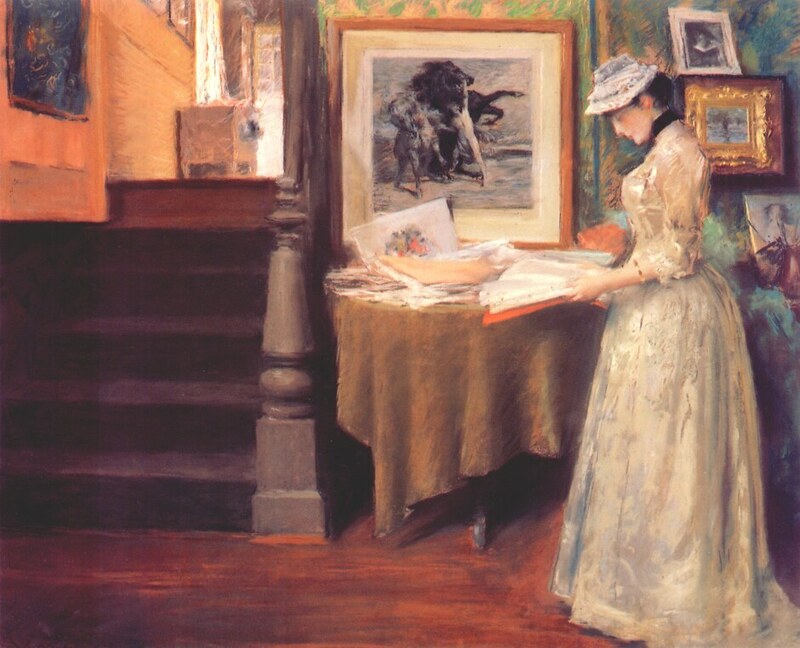 His pastel Shinnecock Studio Interior (1892) shows a very different world, in which his children now play a major part, and the dark furnishings of Tenth Street have made way for light and space. Did You Speak to Me? (c 1897) appears to be another painting of the studio at Shinnecock, with his oldest daughter, Alice Dieudonnée Chase, then aged 10. 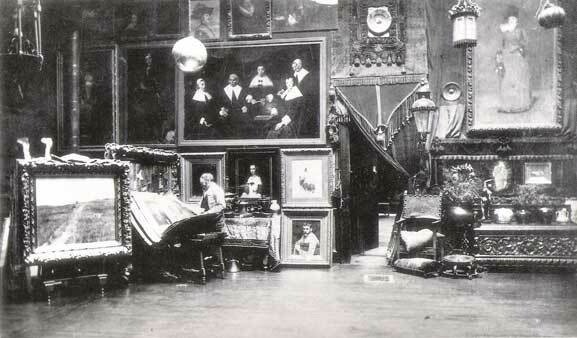 By about 1900, when he painted Alice in the Shinnecock Studio, its walls have been papered, and furniture and bric-à-brac moved in from Tenth Street. His wife Alice (née Gerson) has turned her face away, as if to deny him the portrait, in deference to the fabric of the studio. In 1908, Chase established his Tiffany Building studio at 333 Fourth Avenue, New York City, which remained his main studio until his death. The only painting which I have been able to find of his last studio returns to their role, as his Self Portrait in 4th Avenue Studio (1915-16). This may be unfinished too, as his large canvas contains only rough scribbled brushstrokes, which is peculiar for a self-portrait, and the painting becomes very pale and sketchy at the right. 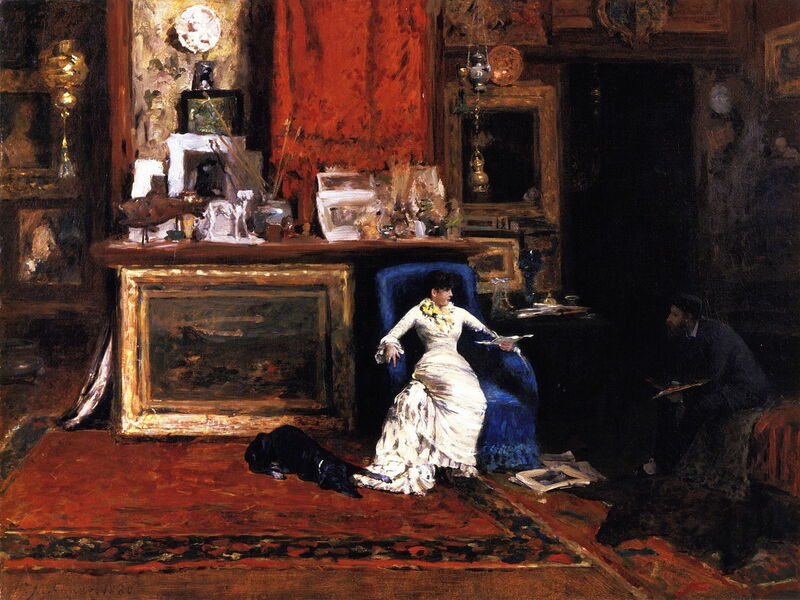 William Merritt Chase died in 1916, a century ago. Forty years later, the Tenth Street Studio was demolished to make way for apartments. Over more then 35 years of painting views of his studio, Chase made them promotional, informal portraits, records of his family, and milestones in his career. He may have been one of the first to do so, but he was by no means the last. Posted in General, Painting and tagged Chase, Duveneck, painting, portrait, Sargent, studio. Bookmark the permalink. I have corrected the name of the architect responsible for the Tenth Street Studio Building to Richard Morris Hunt, brother of William. I apologise for my previous error in which I had confused them.